I will attempt to capture the main points from the meeting. My philosophy for the academy is that it’s all about laying foundations; good strokes and skills are the building blocks for speed in the future. The academy is about building these and that needs to be done with focus and not speed. Listening and attempting to implement the coaching points given, and retaining them through subsequent sessions is key. There is a lot for the children to learn! Stroke improvement, streamlining, starts and turns for all the strokes and those needed for individual medleys, pacing and use of the clock, lane discipline, avoiding disqualifications (which is mostly about applying the knowledge that they have), and much more. The pre-pool exercises that we encourage the children to do before they start their sessions is another area that they need to learn for the future. It is really helpful if the swimmers can be on poolside early enough to allow this to happen. On a Saturday this can be done around the diving pit from 7.50am. Midweek is harder as we don’t have access to the pool early. We understand that coming late to a session may be occasionally unavoidable but it is quite disruptive. All the coaches start the sessions by explaining to the children what they will be doing and why do missing this is not helpful to the swimmers. Attendance. It is helpful to know if a child is going to be away for a week or so (so we don’t wonder where they are) and especially if they are away due to illness or injury as return then may need monitoring. I tried to explain the balance – that missing a session for a social events, or a school event is fine, and actually healthy. Some children participate in several sports and at this stage that is a good thing (when they are older they may need to choose their sport but not yet!). Equally the more sessions the children can attend the more progress they will make. We are trying to foster increasing amounts of independence in the children. Encourage them to become responsible for their own equipment – goggles, bringing a drink to training, being aware of what they are doing. Part of this process is developing a dialogue with their coaches. Please encourage the children to talk to their coach themselves rather than via their parents. The main job of parents is to support their children – to encourage, to listen,, to support unconditionally, but not to coach their children which can lead to misunderstandings and confusion – please trust us to do the right thing for your child (but also give us the information that we need to do this). Competitions. I attempt to email to the squads when there is a competition that is suitable and desirable for the swimmers to enter. I try to be clear about the process that needs to be followed. The discussion between the swimmer and the coach is really important and will continue to be so throughout their swimming lives. Please support us with this process and don’t enter the children without this dialogue taking place. our last session before our short Christmas break will be Saturday 23rd December. 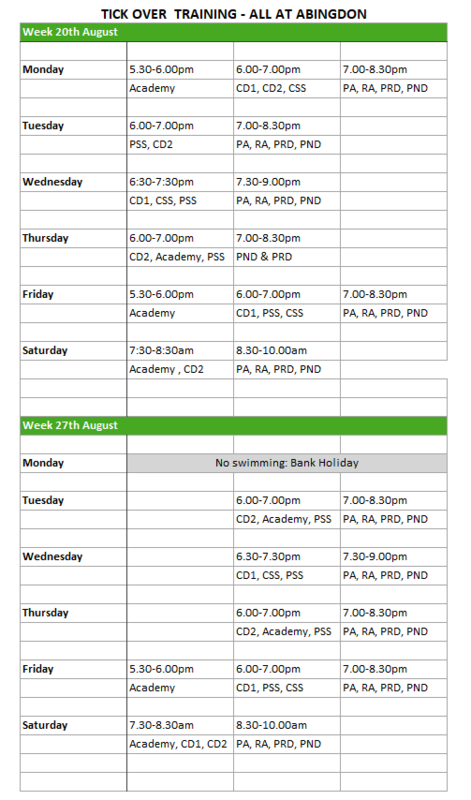 Please see the squad pages for the training times and locations for this season which starts Monday 4th September.